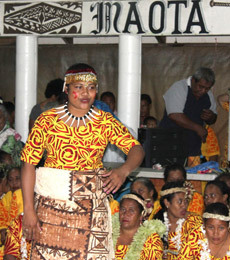 Although there is still a gender disparity in the private sector, 40 per cent of businesses are headed by women.11 In 2013, Samoa passed the Labour and Employment Relations Act that provides stricter guidelines addressing sexual harassment and non-discrimination against applicants who are pregnant, requiring mandatory paid maternity leave and equal pay without discrimination based on gender. Samoa is a signatory to a range of international and regional commitments, including the Convention on the Elimination of all Forms of Discrimination Against Women. These commitments are premised on the belief and understanding that gender equality goes hand-in-hand with sustainable national development. 24 per cent of women participate in the labour force (includes formal and informal economy). 16 per cent gender gap in the labour force participation rate (male to female). Samoa has ratified the Convention on the Elimination of All Forms of Discrimination Against Women. 26.9 per cent is the contraceptive prevalence rate of women aged between 15-49. 120 is the Gender Parity Index for secondary school enrolment (gross) in 2015 – for every 100 boys enrolled, there were 120 girls enrolled. Through Pacific Women, the Australian Government will spend approximately $9.3 million over 10 years (2012–2022) on initiatives supporting women’s empowerment in Samoa. 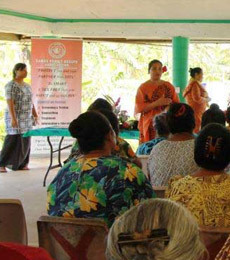 More information on the partnership and nature of support is included in the Pacific Women Samoa Country Plan Summary. Details on activities currently underway in-country with various partners is available via our interactive map. The list of program partners can be found here. Samoa is also supported by Pacific Women’s regional program, details of which can be viewed on the interactive map under regional activities. Noticing a high number of children street vendors, the Pacific Women-funded Samoan Women Shaping Development program investigated. They discovered the underlying causes leading to children vending were poverty, unemployment of parents, and a lack of income to support large families and responded with a project that is helping six families to increase incomes and return children vendors to school. Recognizing that alcohol and drug use contributes to violence, Samoan Women Shaping Samoan Development (SWSDP) is funding a case management officer at the pilot Alcohol and Drugs Court. By partnering on this new court initiative with the Ministry of Justice, Courts and Administration, the Australian aid program’s Pacific Women Shaping Pacific Development initiative is helping to reduce incidences of substance abuse and violence against women. The Samoa Family Health Association (SFHA) is Samoa’s leading provider of sexual and reproductive health and rights (SRHR) services. With support from IPPF, SFHA provided services to more than 10 percent of Samoa’s population in 2015. The Pacific Women-funded Samoan Women Shaping Development program is implemented by the Samoan Ministry of Women, Community and Social Development with civil society, government and private sector partners. The program’s approach to improving gender equality in Samoa is holistic and grounded in respect for Samoan culture.